Step into an 8-foot cube and become surrounded by video projections of single-celled marine organisms — called dinoflagellates — reacting to various stimulants such as the human heartbeat, music, water flow, and air pressure. 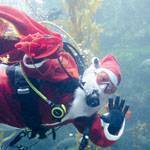 Birch Aquarium at Scripps is transformed into a holiday wonderland full of SEAsonal activities for the whole family. Access your account and post or edit event. New? Sign up for an account. Sign up to receive a weekly email or RSS feed highlighting campus events. Questions, comments, compliments? Let us know what you think by filling out our user feedback form.